And, please share! If you love the Fun eReader, shout about it to friends and family and rate us in itunes customer reviews. or call us at (877) 243-3457. Award-winning, dual-language, interactive ebooks with subtle, science and math themes will “light the fire” of inquisitiveness. Each ebook has a “fun, cuddle factor” so that reading can be for just the joy of reading or build in a few extra minutes to work with your children on the underlying science and math. Find a 3-6 page “For Creative Minds” section in the back of each book with easy-to-understand activities specifically designed so that parents and adults can be the “teachers” long after their schooling days. Parents and teachers are given the tools they need to answer the “why” questions. Activities are designed to engage children and are so much more than a list of “fun facts” often with matching, sequencing, and true/false questions to develop critical thinking skills. These activities make each book so much more than just a picture book … the books become tools to get readers (the children and the adults in their lives) excited about the underlying subjects and to become a “launch pad” for more discussion and learning. Engaging stories and spectacular art come alive as these ebooks read-aloud in both English and Spanish! They also feature word highlighting and audio speed control to improve reading speed and comprehension and to aid in language learning. - ebooks stream from the cloud (default). For slower internet or during travel, download to your ipad. - eBooks feature Read-to-Me / Read-to-Myself, Auto Play, and English / Spanish selection on-the-fly, and Audio Speed Control. - From inside each eBook, click the "More.." button to access each title's 30-50 page Teaching Activity, 3 Interactive Quizzes, Links to Related Websites, and Trailers. - Search & Sort. Search by title, author, keywords, animals in the book. Sort by Common Core, Science Subjects, and Reading Levels. - Download, Uninstall, and Buy Me options on the Manage eBooks page (via My Account page). - Easy (optional) Registration for (1) New Users, (2) Existing Personal eLibrary customers, (3) existing School & Library eBook Site License members. - In-App purchase with AppleID and password or use our Online Store. eBook operation. eBooks open full screen in 'Read-to-Myself', 'Manual Play', 'English' mode. To hear audio, press either the play button or 'Read-to-Me'. For quiet press 'Read-to-Myself.' Press 'Spanish' or 'English' to switch languages anytime whether in Manual Mode or Auto Play. In Manual Mode, pages advance and go back by page drag, tap, flick, or press the arrows. To start 'Auto-Play' from any page, press the 'Auto Play' button (little triangle) on the right side of the eBook navigation bar. The checkerblock button on the right opens the filmstrip so you can scroll and quickly navigate to new pages. Tap the ebook mid-page to display or hide the eBook navigation bar. Cloud and Download operation. eBooks play via the internet by cloud streaming but you also have the option to download. To play via cloud, just register the app and when you go to the eBook page, all eBooks that have been purchased are ready to play with cloud streaming as the default. If your internet connection is running slow or you are traveling, you can download the eBooks to your iPad. To download, go to "My Account" page and from there "Manage eBooks" page. Once an eBook is downloaded, the App plays downloaded versions regardless of cloud access. Purchase eBooks. (1) Through the individual, 11-page eBook previews (with the red preview stripe), or (2) Through the My Account page, click the orange 'Manage eBooks' buttons then select either individual eBooks or the eight Multi-eBook groupings (which together comprise our "All-Title Set"), or (3) Arbordale website's online store. In-App vs Online Store. We have two storefronts you can choose from, the In-App store and the online store from our website. Pricing is the same at the two storefronts for like items. The In-App store uses your AppleID and charges through iTunes. The In-App store is entitled "Manage eBooks" and purchases are for lifetime only. 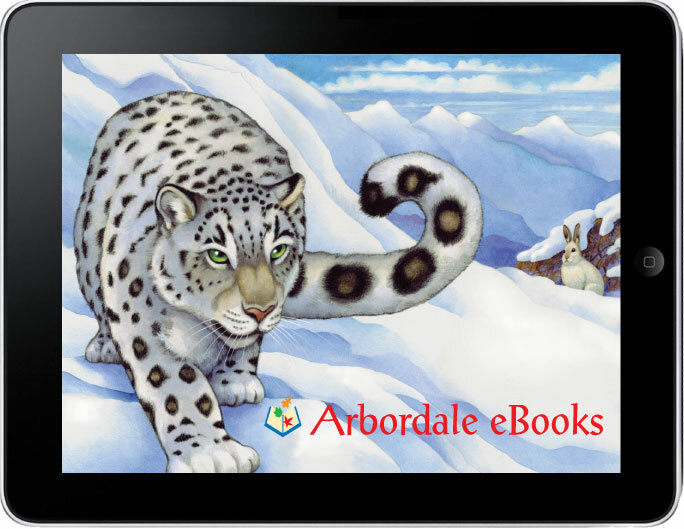 Our Arbordale website's Online Store has lifetime and 1-5 year pricing and offers eBooks by the title and a wide assortment of predefined sets by: Common Core & Science, or Reading Level, or Season. Both stores offer the the same eBook price reductions when buying the bundled "sets" (multi-eBook groupings). Indications of purchase: (1) eBooks not purchased are displayed with a red preview stripe and when clicked, open a 14-page eBook preview rather than the full eBook. After purchase, the red preview stripe disappears. (2) MyAccount page shows the number of eBooks purchased with a dropdown listing; (3) On the "Manage eBooks" page, eBooks not purchased are shown with a blue "Buy Now" button; eBooks that have been purchased are shown with a green "Download" button. Download eBooks. Download either individual eBooks or the eight Multi-eBook groupings. Go to the My Account page, click the orange "Manage eBooks" button. Purchased eBooks or Multi-eBook groupings will have green 'Download' buttons to the right. Press any green "Download" button to start a download. Indication of Download. (1) On the eBook page, a green check is displayed under eBooks that have been downloaded, (2) MyAccount page shows the number of eBooks downloaded with a dropdown listing, (3) Manage eBooks page buttons change from green "Download" to red "Uninstall." Remove Downloaded eBooks from iPad memory. If you want to remove a downloaded eBook or Multi-eBook group, just press the red "Uninstall" buttons and the eBooks are instantly removed. Uninstalled eBooks remain available for cloud viewing. Browsed Pages. The "eBook page" and the "MyAccount page" are internal to the App. All other pages (Quizzes, Teaching Activities, Reading Levels, Usage Data, etc.) are web based and require that your iPad be connected to the internet. Once browsing, to return to the eBooks, tap the "Close" button, then "eBooks". Personal eLibrary vs eBook Site License. Personal eLibraries are intended for individuals to use on family ipads and computers. Teachers can use Personal eLibraries on iPads & computers in a single classroom using their email and password but that is not to be shared or sent home with the children. eBook Site Licenses are sold to schools and public libraries for unlimited access on all building iPads and computers. For home access by the children and their families we provide a password protected button for your website and we encourage schools to also send the desktop icon links and the 6-digit site code home with the children. I have installed the Fun eReader App, what does the registration mean? The first time the App is opened, it asks you if you wish to register (which we recommend). There are initially two Registration access types: New to Arbordale or Existing Customers. (1) New users sign-up with name, email and password (in an orange box) and they have the option of continuing without registration. (2) Existing Arbordale customers breakdown into two sub-types, either: Personal eLibrary users (individuals) or eBook Site License users (accessing through a school or library account). (2a) Personal eLibrary users log in with their existing online account (enter account email and password in the green box). (2b) School or public library users login using the 6-digit site code provided by your school or library (enter code in the red box). If I choose to continue without registering, what is the downside? Can I still buy and view eBooks? The downside of not registering is that you will only be able to play purchased eBooks on your iPad and will not be able to access eBooks on computers and flash capable devices. We recommend that you register because that creates a Arbordale account which then allows you to login to our website and access your eBooks on all computers and flash capable mobile devices. If you do not register, you can still buy eBooks but only to view on your iPad. The purchase itself is through the In-App store using your AppleID and your iTunes account just as you would had you registered. I registered as a New User but have logged out. How do I log back in? If you ever logout and want to log back in, you'll need to log back in as a Personal eLibrary user. Your initial sign-up created a Arbordale user account establishing you as an existing customer and you are no longer "New to Arbordale". When the pop-up asks, "are you New to Arbordale or an existing user? ", choose existing user then login to your "Personal eLibrary" using your account email and password (in the green box). I already have online access to Arbordale eBooks through a Personal eLibrary or site license. Do I have to buy books through the iPad App? No, you actually have a choice. You can continue as you have in the past, to purchase using our website's online store or you can buy eBooks though the Fun eReader as an In-App Purchase using your AppleID and password. To get to the In-App store (our "Add eBooks" page), open any eBook preview and tap the blue "Buy" button. You can also access the In-App store by going to the "My Account" page and select the orange "Manage eBooks" button then press any blue "Buy Now" button. How can I see which books I have purchased? 3 ways: (1) purchased eBooks are displayed on the eBook page as cover images. eBooks not purchased will display with a red preview stripe across the lower right corner. (2) on the MyAccount page there is a counter displaying the number of eBooks purchased with a dropdown listing of the specific titles, (3) on the Manage eBooks page purchased eBooks are shown with either a green "Download" or a red "Uninstall" button. eBooks not purchased will have a blue "Buy Now" button. We love the books but they feel sluggish and the blue loading page keeps coming up. what should I do? That indicates that your internet speed may not be high enough for cloud streaming which is the default mode for the Fun eReader. If your eBooks are bogging down, download the eBooks to your iPad for local play. That solves the sluggish eBook problem and is also great s if you are traveling without internet connection. As internet speeds improve, or if you are getting low on iPad memory, you can always "Uninstall" the eBook which reverts back to cloud streaming. How can I see which books I have downloaded? 3 ways: (1) downloads are displayed on the eBook page with a green checkmark underneath, (2) on the MyAccount page there is a counter displaying the number of eBooks downloaded with a dropdown listing of the specific titles, (3) on the Manage eBooks page downloads are shown with a red "Uninstall" button. If your iPad is getting low on memory, you can uninstall it. What does the red "Uninstall" button mean on the Manage eBooks page? Will I still be able to play my purchased eBooks after Uninstalling? Yes, you can still play purchased eBooks. By Uninstall, we really mean Un-download, if you will. when you press Uninstall, the downloaded eBook file is removed from iPad memory but the Fun eReader knows that you have purchased the eBook and will revert to playing the eBook by cloud streaming (which is its default). I can’t find the Arbordale App on my iPhone or iPod? The app is currently only available for the iPad but we are working on it..
For our school's eBook Site License, will I need to share this 6-digit access code with each classroom teacher? ... we have 21 iPads. Entry of the code must be done on each iPad but it only has to be done the first time. After that it remembers the code and just works. What happens after our school's 30-day free trial is over? Are we obligated for anything? Do you suddenly start billing me? Actually we are a lot nicer than that. There really is no purchase here and no obligation except that you enjoy, if you wish. When the trial expires, the eBooks will appear shaded and will no longer open. At that point, if you want to buy, you can, but no pressure from us. Use on all building computers, iPads, smartboards, and on secure websites. Works on all PCs, Macs, and iPads via broadband internet access. No special software, plug-ins or eBook reading devices. Call 877-243-3457 (toll free) or email and we’ll set-it up for you. We send you an email with set-up instructions and desktop icons and password protected buttons for your website. Buy through the In-App store using your AppleID & password (Click on the shaded eBooks, or go to the MyAccount page and click the orange button (Manage eBooks). InApp Purchases are lifetime only. Buy Personal eLibrary through our Online store. Your email and password will get you iPad access and also access through your computer and other devices. Purchases for 1-5 yr and lifetime.